Vintage Imari Ware Plates Ornamental Gilt Matching Set of 3 Japan 6.25"
This beautiful Oriental Japanese blue Garden platter, measurements 11 by 13 in excellent condition no chips no cracks there are surface marks on the back from shelf use, and some glazing from age. New ListingJapan IMARI WARE Flower Bird pattern Dish Plate 6 1/4"
Vtg 2 JAPANESE. 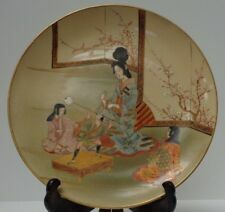 Handpainted Geisha Girl Porcelain Plates Signed 10"
Appear to be hand painted. Good condition. Lovely art and very colorful. Large Plate diameter 18”. Porcelain Charged Floral Birds Design. Very beautiful. For a fine Japanese pottery / porcelain collection. 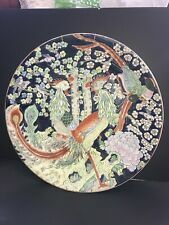 Here is a very fine Japanese hand-painted plate with a beautiful classic nature scene. Signed on the back, with Makers Mark in Japanese symbols and also: Made in Japan Hirano China. Lovely Large Arita Imari Signed Koi 15" Platter. Deep shades of blue, red, green & gold. Vintage Japanese Handpainted Imari Charger Platter, Cherry Blossom Mark, 15 3/4"
1960's Japanese Dragonware Eggshell Porcelain. set of 6 pieces small vases. I will do my best to solve it with you. (Kutani Ware). Wood box 972g. WEIGHT :plate 1328g. We are aiming for a website that can touch Japanese culture and tradition. The gold trim is beginning to show signs of wear. DECORATIVE FLORAL. make Supersized seem small. Get images that. There are 3 holes on the foot, so it could be used as a hanging plate. Material: Porcelain. add to fAVORITES. Up for sale are 2 nicely decorated Japanese plates that looks to be from the late 19th Century. They are solid and heavy for their size. Vintage Japanese Satsuma Lobed Mini Plate Pair 1000 Flowers Millefiori, in excellent condition, no chips or cracks. Age and maker unknown. Approx 3 5/8”W Please look closely at all photos as they are part of the description. Item will be packaged carefully and shipped with insurance. Please send me a message with any questions. Thanks for looking! Vtg Japanese Porcelain Plate 3 pieces Set. Material: Porcelain. Vtg Japanese Pottery Deep Plate Square. Material: Pottery, Ceramic, Yakimono. add to fAVORITES. Floral and Phenix design. SAL and EMS are also available. Both have brass wall hangers. They are hand painted porcelain with many colors includingreds, yellows, blues, orange, gold and more, with gold accents and a gold rim. The design includes yellow Asian flowers, bamboo trees, and floral motifs. Arita Yaki Ware. Geisha Design. Xlarge 16". Decorative Dish. raised areas of design. fabric in design. Japan IMARi WARE Flower Floral Pattern Porcelain Dish Bowl No Chips. Shipped with USPS Priority Mail. Vtg Japanese Porcelain Plate and Bamboo Toothpick holder Set. This is a very interesting set and would make an excellent addition to your kitchen table. Material: Porcelain, Wood, Bamboo. Details: This is a Japanese Vtg small plate or Japanese kozara from Japan. Material: Porcelain. add to fAVORITES. 1950's Japanese Dragonware Eggshell Porcelain. Tea set to 4 diners with a face of Geisha lithophane. spots of color on the embossing parts. I will do my best to solve it with you. This unique, artistically hand-painted scenic porcelain plate depicts a mountain scene with a winding forest path. The back of the beautiful plate features 3 holes for threading wire or string for hanging on the wall. Japanese Cloissone Kozara Small Plate 3 pc Set. Japanese cloisonne small plate, Kozara. Good condition. No chip or crack. 3 different color, blue, pink, and gold. Standard and EMS are also available. Condition:used scratch and dirt Material:porcelain 12 Pcs Set Please watch photos carefully. Pair of Japanese Imari ?. Porcelain Hand Painted SUSHI Dishes Signed. A TRULY DELIGHTFUL & PRACTICAL JAPANESE PORCELAIN SUSHI PLATE DISHES TO ADD TO YOUR COLLECTION, DINNERWARE ACTIVE USE. Markers mark signed on the bottom see photos. Back is marked, "Hand Decorated Japan.". This is a niceAntique Royal Nippon Porcelain "Kinran" Floral Teapot. This piece is in pretty nice condition with no nicks or cracks and everything. Japan IMARI WARE Flower Bird Pattern Handpainted Porcelain Dish Plate 6 1/4"
Very Good Condition. Does have small area on the red border where the paint rubbed off. 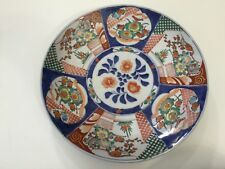 A beautiful floral Kutani plate with a flower border encircling the center design. colors are blue, yellow, orange and pink flowers with two-toned green leaves. marks it's unused with the original gold label attached on the back. Up for sale are 5 pieces of old Japanese auspicious motif porcelain individual plates. Material: porcelain. Age: mid - late 20th century. Net weight (approx.). : 854g/30.12oz including the paper box. It is a dish considered Imari grill. Pine bamboo plum, cherry blossoms. Diameter 19 cm, height 4.2 cm. ACF Japanese Porcelain Hand Rose Painted Medallion Plate Vintage Made Hong Kong. Good Condition Measures 10 1/4" diameter Please checkout my store. Size (approx) Diameter 24.5 cm Height 5.5 cm State Although there are some changes due to aging, I think that it is a beautiful item without conspicuous chipping and cracking. No box. Vtg Japanese Porcelain Plate Chrysanthemum Sparrow Flower Bird. 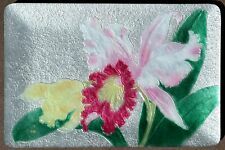 This plate features hand-painted chrysanthemums and sparrow. Material: Porcelain. add to fAVORITES. The decoration is of Kannon with two rakans on each side of her. Appears to have occurred during the hand painting. AGE :1935-1970. CONDITION : Used item in good condition. Japan IMARI WARE Flower Bird pattern Dish Plate 6 1/4"